A KEY ingredient that constitutes a strong nation lies in the hands of its well-informed citizens. This implies that a populace is knowledgeable, well-developed and rounded individuals. However, one could argue that our education system has not adequately met the standards needed to harness the full potential of our citizens — it stops short at providing channels for creativity to foster. What we have is an inherently rigid structure that is reliant on standardised exams and places too much emphasis on the binary subjects of science and mathematics. The assumption that these subjects are the only prosperous route for the future hinders students’ comprehensive growth. It deprives them of various elements of knowledge found through the medium of creative subjects that range from art, music, drama to social sciences, such as politics and philosophy, that are key to the development of the individual. Creative subjects are instrumental in reflecting alternative facets of intelligence that cannot otherwise be extracted from subjects such as science and mathematics. Independence, critical thinking, curiosity, innovativeness, originality and problem-solving are just some of the qualities that are developed by creativity. By placing more importance on creative subjects, the desired spirit of entrepreneurism will be considerably enhanced, thus enabling economic growth of a diversified nature. In today’s age, innovative thinking is encouraged across the globe, yet the same cannot be said for Malaysia. The national curriculum seems to stifle creativity instead of cultivating it. By making creativity a priority in the national agenda, it will give the country a greater competitive foothold in an increasingly complex global economy. Creative subjects are useful in their own right. They encourage self-expression, confidence and individualism that are needed for growth. Furthermore, it can support and strengthen culture, positively developing a wholesome society by fulfilling the goal of national education policy. According to this policy, education in Malaysia should strive to produce individuals who are intellectually, spiritually, emotionally and physically balanced. Thus, an imperative weight-shift within the national curriculum must occur, and it begins by prioritising creative subjects to bring them in line with traditionally “hard” subjects. Take for example South Korea — its national education curriculum in 2015 made the “creative and integrative learner” the key objective in the reforms. The introduction of the Free Semester Programme (FSP) saw the reduction of test-related pressures in the school system. It was replaced with a student-centred approach. A noteworthy development was the “teacher research societies” where experts from relevant fields such as policy-makers would collaborate to discuss best practices for learning. This way, the education system is kept up-to-date. Singapore has also regarded creative imagination as one of the fundamental aspects of a successful education system. Under “Thinking Schools, Learning Nation” in 1997, the development of a critical and creative thinking culture within schools were formulated. Taking a step further, Singapore also introduced “niche schools” — which placed greater emphasis on the study of the arts. Interestingly, one of the few schemes focused on the need for a decentralised education system aimed at giving greater autonomy to teachers. Further investments were also made for the process of the teacher learning experience, which included developments of specialised learning communities. The Programme for International Student Assessment rewarded these efforts, and Singapore was awarded the best education system in the world in 2015. As the engine for educational development, creativity should be given the highest priority as part of the reforms in Malaysia. While there have been efforts, such as the iTHINK project, more needs to be done to truly capture and embed creativity into the national curriculum. In November 2018, 19.1 per cent of total government spending was allocated for education, cementing a nationwide commitment to rehabilitate the current system. Despite such commendable measures, there needs to be greater contribution to the enhancement of creative projects. Perhaps, more value and resources should be channelled towards the quality of teacher training and those responsible in promoting creativity. The time has come for a meticulous re-evaluation of our education curriculum that will bring it up to speed in the global economy. By Tengku Ilisha Ameera Al-Sultan Abdullah. Teaching and learning content is ready for teachers to use in the classroom on Frog Boost. Ready teaching and learning content and materials covering all core subjects for primary school up to secondary level will be made available in May through Frog Boost, a content repository on the Frog Virtual Learning Environment (VLE) platform which is accessible to schools across the country. 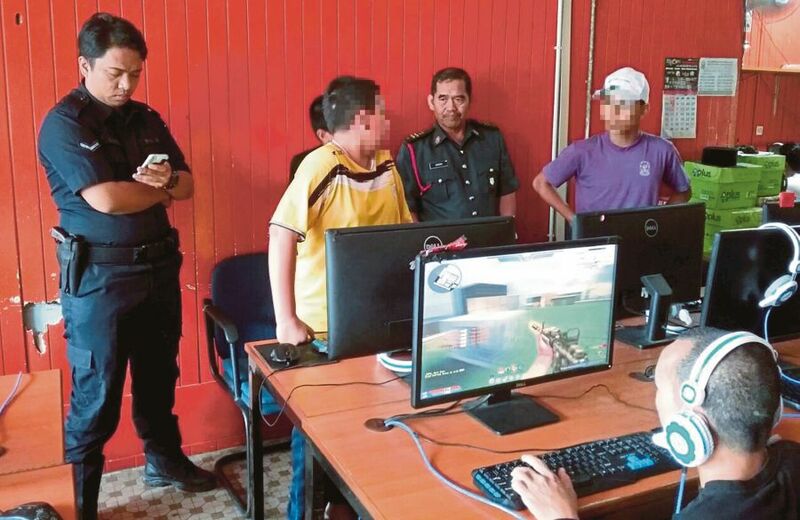 The operator of Frog VLE, FrogAsia Sdn Bhd, said this move will help ease the burden of teachers who are often hard-pressed for time to prepare teaching and learning content and material for the classroom as well provide ongoing assessment for students. 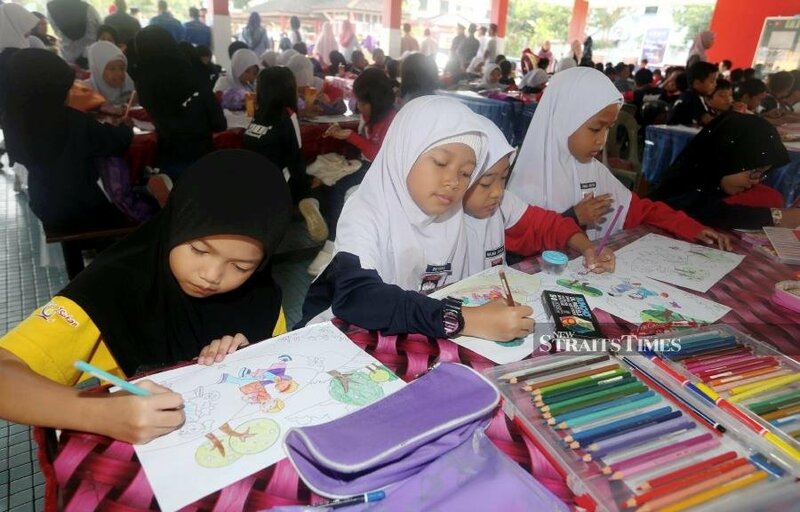 FrogAsia’s executive director Lou Yeoh said in May, content, and quizzes for subjects such as English, Bahasa Melayu, Math, Science and Sejarah will first be available for national type secondary school (Sekolah Menengah Kebangsaan) to be followed by vernacular primary schools (Sekolah Jenis Kebangsaan Cina and Sekolah Jenis Kebangsaan Tamil). “Since introduced in July last year, Frog Boost now has Mathematics, English and Science contents and quizzes available covering the syllabus from Primary Year 1 to Form 5 of secondary school. It offers more than 135 million items of teaching and learning content ready for teachers to use, instead of having to develop their teaching materials from scratch,” she said. “At FrogAsia, we applaud the government’s aim in easing the burden of teachers as we believe in making a difference in the education landscape across Malaysia. FrogAsia believes that it is important for teachers and students to have access to a repository of high quality, credible content. 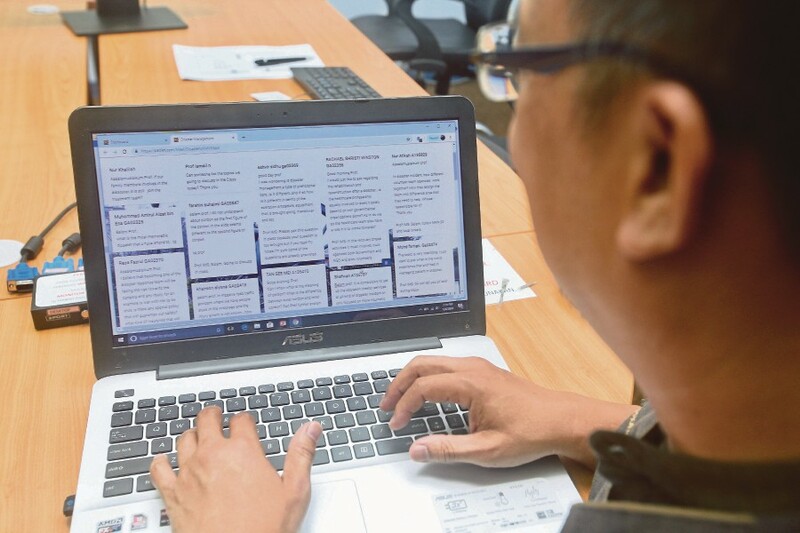 That way, teachers can save time creating content, besides sharing their own content with other teachers across the country,” said Yeoh. ONE of the key purpose of tertiary education today is to generate holistic graduates who can compete globally and be ready take on challenges being brought about by the technological development of the Industrial Revolution 4.0 (IR 4.0) – which is affecting the jobsphere by creating new knowledge and skills requirement. Hence, student experience at higher education insitutions must facilitate the opportunity for every student to learn in innovative ways that is engaging, enabling them to reach their full potential and develop skills that will help them thrive in the future. 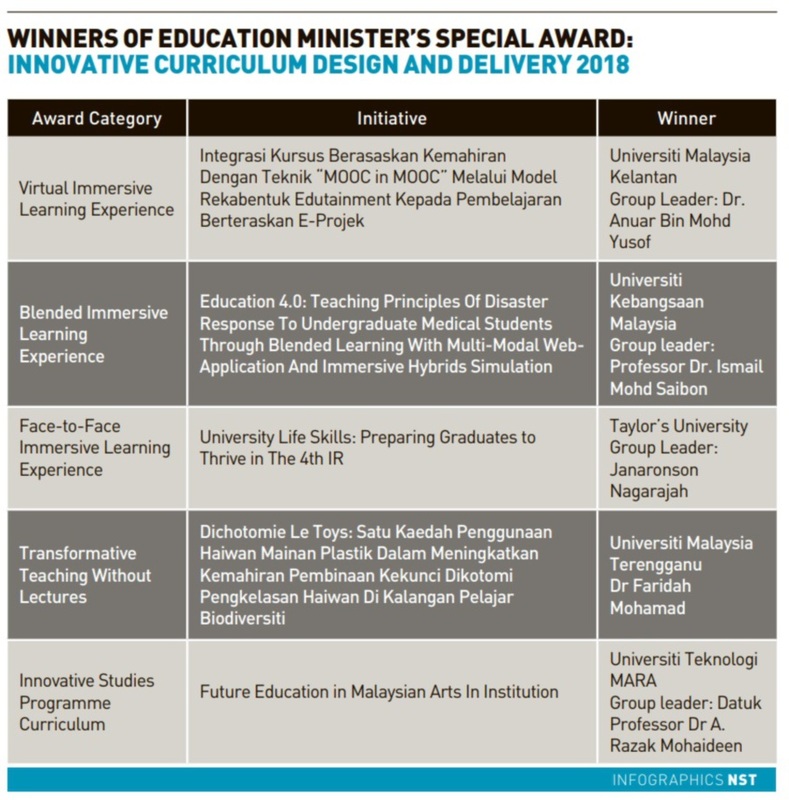 Education Minister Dr Mazlee Malik at the Education Minister’s Special Award Ceremony: Innovative Curriculum Design and Delivery 2018 (AKRI 2018) last month said lecturers should be dynamic and adapt to various changes and yet hold on to the basic concepts of higher education. And that there must be a culture of innovation in the profession of lecturers to diversify teaching and learning methods. Associate Professor Dr Wan Zuhainis Saad, a lecturer who has been teaching at the biotechnology and molecular science at Universiti Putra Malaysia (UPM) for the past 11 years and is currently seconded to the Department of Higher Education, Ministry of Education as the Director of Academic Development Management Division, believes in empowering learners, learning by doing and experiential learning. “Students nowadays who are from Generation Z (people born from the mid-1990s to the early 2000s) are different from those in other generations. They want to be involved, and have freedom to speak their own mind in their learning experience. “As an educator, we need to create that opportunity for them to unleash their creative potential, skills and innovation. We need to design the learning activities so that students able to identify their capabilities, strengths and weaknesses and those will not happen if only learning through lectures in a conventional classroom setting. 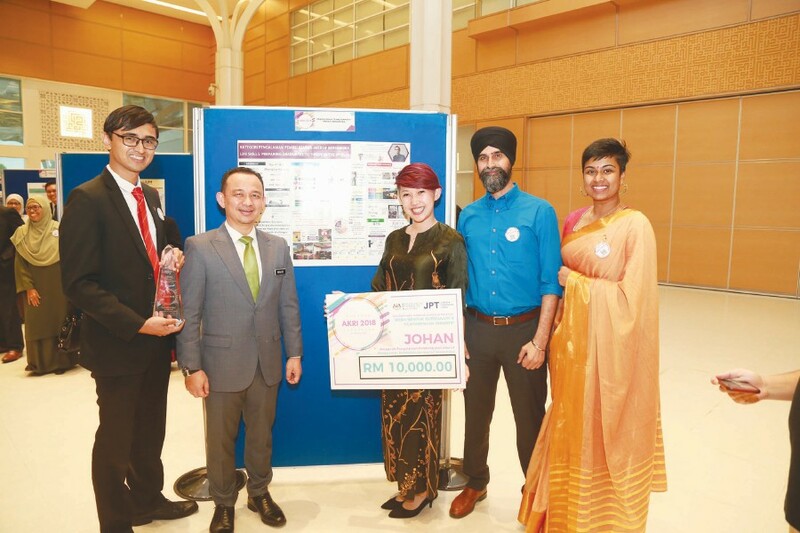 Life Skills Facilitators at Taylor’s University pose with Dr Maszlee Malik and Janaronson Nagarajah (left) after being named the winner for the Face-to-Face Immersive Learning Experience category at AKRI 2018. “We should take the advantages of the great things technology can bring that may not have been possible before,” said the recipient for Teaching award under the Pure Science Cluster category at the 12th National Academic Awards (AAN) last year. SO, what is innovative teaching at university and what shape does it come in? teaching at any level would need to have the same basic ingredient – it has to be learner and learning centered, it needs to be meaningful. It would also require designing tasks or activities that engages learners to become involved in the thinking and learning process as well as learn in a collaborative way and above all learners can have lots of fun when learning. In her view, this would be the essence of designing for learning to take place at the university level and the innovation would really depend on the creativity of the teacher, considering the needs and learner diversity, in order to achieve their goals. “So using flipped classroom where learners can do tasks inside and outside of classroom via technology and the use of various learning tools can assist teachers to provide engaging learning experiences among the learners,” she said. The Anugerah Akademik Negara award winner for Teaching (Applied Arts and Social Science Category), highlighted the current and future generation of university students cannot be separated from technology and have a shorter attention span perhaps due to that though they love to share their experiences, working in a flexible way and they thrive on challenges. “Thus, in order to get them on board in the classroom, teachers in the university level need to be equipped with the know-how of integrating technology and interactive learning in their classroom,” she said. She highlighted that the challenges for faculty members at tertiary level occurs when they are required to become involved in research and publication and the emphases that have been given to these activities can sometimes be overwhelming for academicians when designing innovative and meaningful teaching at the university level that sometimes result in traditional lecture becoming inevitable. “Hopefully make universities understand and place greater emphasis on the importance of ensuring that academicians become motivated to place innovative teaching as central in their teaching and learning processes,” she said. The UKM Faculty of Medicine E-MERS team discussing the finer details of Immersive Hybrid Simulation session targeted at final-year medical students. On inovative teaching in the fields of applied literature and social science for example, Fauziah useslearner-centered strategies that require students to take ownership of their learning when solving problems in various ways. This is especially critical as her students are from the education programmes whom ultimately, she hopes will become innovative teachers in their respective contexts when they graduate from their studies. “While ensuring that the learning outcomes of the courses are achieved, there is also an effort made to prepare them with the obstacles and challenges that they may face in the real world contexts of teaching. “This is done through activities like solving cases provided which enable students to relate theory into practice in a meaningful way. That way it helps students to prepare themselves before they set foot into the real world,” she said. “I am humbled and pleased when getting feedback from past students on how tasks that they did and knowledge as well as skills they have acquired when attending the class as students were relevant and helpful when they became teachers. The received feedbacks motivate me to do more even if it is not easy. After all mediating learning is never easy,” said Fauziah. Asked about her teaching strategies in teaching pure sciences subject, UPM’s microbiology lecturer Associate Professor Dr Wan Zuhainis Saad said it’s all about curiosity, exploration, and relationship. “We need to deliver content in a manner that will spike students curiosity, instil their interest and allow them to see things differently. I practice BYOD (Bring Your Own Device). Students will come in with their own gadgets, smartphones, laptops, iPads. hey will come in prepared because they know they need to participate in activities prepared for them by me or their classmates. I don’t have to worry about attendance because they won’t miss my classes. It is an active learning environment,” she said. She believes active learning promotes innovation and creativity. “I will have activities for each lecture, lots of formative assessment, interaction, participation, engagement and group work. Students have the freedom to throw out ideas and suggestions, interactive and engaged. In the words of Einstein, I don’t teach my students, I just attempt to create the environment in which they can learn,” she said. Wan Zuhainis practices blended learning using flipped classroom with Web 2.0 tools. The learning materials are prepared earlier with interactive video quizzes using EdPuzzle. The tasks are distributed among the group of students that will prepare the learning materials for a particular topic for the whole class. “You’ll be amazed on what they can do. I use Project Oriented Based Learning (POBL). A project is designed for the students encompass the content for the whole semester. We will discuss progress, problems, sharing ideas on the project. Usually they are big events such as Mini Showcase of Microbial Ecology where students were the organising Committee. and Virtual Microbes, a virtual peer-learning project to learn microbes with students from eight ifferent universities, including Lafayett College, USA. It not only teaches others, students learn best by doing and experiential learning,” she said. “As a 21stCentury educator, a learning designer, we have to be ready to learn, unlearn and relearn. Learning takes place in many different circumstances and contexts and learning is process that never ends. Our enthusiasms, passion and excitement for learning should be contagious and infectious, and everyone must be infected,” Wan Zuhainis said. Taylor’s University Face-to-Face Immersive Learning Experience project, which won an award in the category at the Education Minister’s Special Award Ceremony: Innovative Curriculum Design and Delivery 2018 (AKRI 2018) last December, goes back to 2014 when Taylor’s University launched the Shine Award programme to enable its students to develop their life skills aptitude, which would see them improve on their lifelong life skills and emotional wellbeing capabilities. It is actually the implementation of two subjects – Life Skills for Success and Well-Being and Millennials in Malaysia: Team Dynamics and Relationship Management – which is targeted to help students to focus on developing themselves to be emotionally intelligent and be able to interact with others. “This innovative approach to education was the brainchild of the Deputy Vice-Chancellor and Chief Academic Officer, Professor Dr Pradeep Nair who saw the merit in introducing this after talking to industry leaders who shared about how they also assess emotional intelligence when hiring graduates,” said Janaronson, who is the Associate Director of Integrated Teaching and Life-long Learning Center at Taylor’s (INTELLECT). A specialised team, called the Life Skills Coaches/Facilitators who come from various backgrounds, was appointed to look into this aspect of the learning. The Life Skills Facilitators, which include certified coaches, clinical psychologist, humanitarian and corporate trainers among others, deliver these life skills modules to all first-year students, providing them the opportunity to enter into a journey of self-discovery, catching foundational life skills, emotional intelligence and tools that will help with emotional well-being. “While this was first introduced on a voluntary basis, the programme was met with positive response by the students which led to the establishment of a more comprehensive framework that was introduced as part of the Taylor’s Curriculum Framework which was launched last year,” said Janaronson. “It’s a new approach to learning and all our students in the diploma and degree programmes are enrolled for these two modules in their first year, regardless of their course of study,” he said. He elaborated by going through the two subjects, at the end of the semester, the students will have the opportunity to go through a self-discovery process and know how to thrive in a team setting and how to give neutral responses and behave with people in teams. “This is important because research has indicated that the one reality is that those in the workforce in the future will work across different teams, in different sectors and also spanning cultures,” he said. he highlighted the initiative has been met with positive response, with close to 90 per cent of students involved sharing that they found the two modules helpful and provided them the platform to safely develop their emotional wellbeing in a positive manner. “Our team have also been approached by an industry partner who recognises the impact of this approach and wanted a custom-made 10 week module for their scholars,” shared Janaroson. As educators, he commented it is necessary to be innovative as it will allow instructors/ lecturers to remain relevant to the needs of students. “The Life Skills modules provide a platform to the Life Skills Facilitators to constantly enhance the way they engage their students and allow the students to be future ready,” Janaronosn said. DrFaridah Mohamad a new approach to the teaching of ‘building and using a dichotomous key’ for first year biodiversity students. These skills, she said, are crucial for biodiversity graduates who will end up working in the biodiversity field later where they will be the ones holding the responsibility of exploring and safeguarding the mega-biodiversity. Therefore, she highlighted, skills in classification of organisms which involves building and using dichotomous key is crucial. The things that triggers me to do this was when we noticed that majority of our final year students failed to demonstrate good knowledge and skill in identification and description of species when they presented their final year project, despite have been taught these lesson and skills during their first year. “And so I thought of changing the way it is taught, but retaining all the learning outcomes. The only change I tried was the delivery of the course, from lecture based to activity based, where students took charge of their own learning by applying active learning in class,” said Faridah. The original course involved lecture and practical sessions. What Faridah did was to select the original most basic practical module, where students were taught and required to classify lab apparatus and stationaries into their own classes. “This is the basic of making organism classification. I expanded this module to become the center of my teaching of the course. But instead of using those materials, I changed them to lovely coloured, cute toys of all sorts. The whole process of remodelling the module and crafting the activities took me quite sometime but it’s all worth it when comments from students were extremely encouraging,” she explained. Under Dichotomie Le Toys, a 2-3 hour activity was carried out in a group of five without given any prior lecture on the topic. The students further applied their understanding of the practical sessions using real plant and animal specimens and using various published taxonomic keys available. The whole process of the activity was done on a basis of active learning where students took charge of their own learning through learning-by-doing, peer, collaborative and self-determined learning. Each group was given a task to classify a set of 12-13 plastic toys of all sorts according to their creativity. While trying to complete the task, they listed the problems they faced, compared and discussed with the whole class facilitated by the lecturer. The importance of having a system to simplify the classification process is highlighted, followed by the introduction of “Dichotomous Key” terminology. Each member of the group was then instructed to read an article of their choice from the internet, share with others and finally managed to build a correct dichotomous key of their toys. “We started this new approach in 2017, and the students are now in their final year. Spontaneous interview carried by my other colleague on some of them add more proves that they are retaining the knowledge and skills they gained from Dichotomie le Toys, and started applying them to various projects that they are working now for their final year projects including birds, bats, fish and plants. “This is precisely what we want from them, able to apply these basic skills taught previously during their study into “real job” situation, and was not happening at the rate we want before this,” said Faridah. 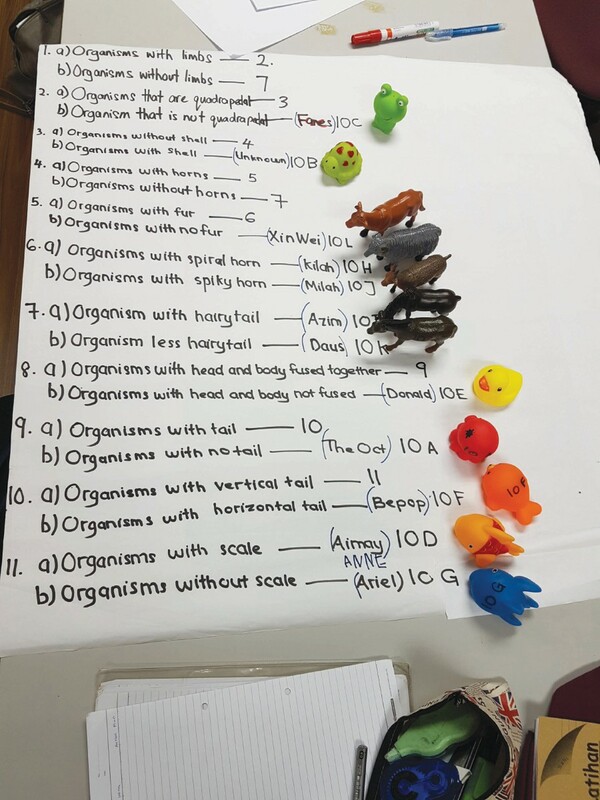 Test done on students gave evidence of correct understanding of the concept and indicate their competence in using dichotomous key to identify organisms and building the key to classify them. “We are working towards better teaching deliveries, especially on topics or subjects that we identify needs to be refreshed. How do we know this? We have their grades as indicators, and we have students’ comments to reflect upon each batch. That will tell us whether the students attain the intended outcomes or not,” she shared. HAVING introduced Disaster Response Medicine as a submodule under Emergency Medicine to the medical undergraduate curriculum at UKM, lecturers of the Department of Emergency soon found the student contact allocation for final year students for a one hour lecture inadequate to impart the principles of disaster response medicine and information for accompanying field experience. “We had one hour of lecture followed by a simulation exercise where we put students through role play on the field. The whole affair is labour intensive with 50 students undergoing the simulation physically either in the ward or an open space each time. And there are 280 students in total for the whole batch, meaning we hat to carry out this simulations five to six times each year. While this disrupts our daily operations in the faculty, there is also no guarantee students will come away with complete knowledge on the overall principles of disaster response medicine as they are stuck with only one role on only one aspect of disaster response medicine during the simulation session,” said UKM Medical Centre senior consultant emergency physican Professor Dr Ismail Mohd Saiboon, who is also a healthcare simulationist educator, and deputy dean of Graduate Studies at UKM’s Faculty of Medicine. So together with six other lecturers, he formed a 7-strong Emergency-Medical Education Research in Simulation (E-MERS) Team to see how can the teaching of the submodule be more effective. Before the actual face-to-face interaction, students had to access a lecture video through a screencast application where they can rewind and repeat as they see fit. An online discusssion ensues for students to put forth questions and request from clarifcation from the lecturer via Padlet which is an interactive platform which allows everyone to join in. Only after that students will have the face-to-face interaction with the lecturer to delve in-depth into the topic after which a post-classroom task is given in preparation for a hands-on experience done through an immersive hybrid simulation (IHS). For the IHS, students are exposed to a pre-recorded audio-visual trigger of an emergency – a vehicle accident or natural disaster – couple with actual role play by students taken on roles such as victims or medical personnel on stage in a lecture theatre hall. There are also students in the audience observing the whole scene. “The victims are done up in woulage which is the art of applying mock injuries for the purpose of training emergency response teams and other medical and military personnel. Those taking on the roles of medical officers will then make decision as to what action or treatment is to be taken; they apply treatment principle, apply critical thinking and decision making. Dr Ismail Mohd Saiboon engaging with finalyear students before a lecture on Disaster Response Medicine. “When the session is over, we perform formative assessment onsite by having students give their responses to questions on what they have seen through an audience response system. Straight away we can see their answers and interact on why they derived on the answers. Students enjoy the experience and the whole process is a good way to ensure understanding on the topic and clear the doubts straightaway,” said Ismail, adding that the whole approach has proven to be highly effective in terms of teaching the topic. The E-MERS team is now looking at putting the initiative into the virtual reality (VR) platform and is in discussion with one local vendor to make it happen. “VR is a good platform to learn procedural medical techniques such as intubation, putting in IV line as the experience will be objective and standard for all medical students. As it is not all medical students get to do the hands-on experience in the wards or surgery, some only get to observe. With VR and simulation this will no longer be an issue,” he said. Ismail also hopes that the mediccal faculty would one day come up massive open online course for learning medicine that would allow anyone anywhere to do so. PLAYING the ukulele and singing during classroom lessons to learn a language? This is one of the many methods English teacher Samuel Isaiah has up his sleeve to make the most of 21st century learning concepts. “The common belief that 21st century learning only involves technology is wrong. “We get the children to collaborate and carry out teamwork activities. Samuel was speaking at the launch of an Education Ministry initiative, the 21st Century Learning (PAK21) Teachers’ Campaign. The campaign will run until the end of January 2019 and is open to teachers in national schools. Its objective is to share best practices on how teachers inculcate PAK21 into their classrooms and encourages them to upload their creative strategies through a 300-word write-up or through a three-minute video on the campaign’s official website at gurupak21.com. Ten teachers with the most effective and creative strategies will be selected to receive professional mentorship, win attractive prizes, and receive a private audience with Education Minister Dr Maszlee Malik. If learning isn’t fun and meaningful, Samuel said, pupils will be disengaged and wouldn’t want to be in school. “With 21st century learning in place, it enhances creativity, collaboration and communication among pupils. “My pupils love it because they get involved and they don’t realise that they are actually learning through this method. “We live in a day and age where a person’s intelligence and capability is not merely based on what you write on a piece of paper; it involves problem solving and the ability to adapt. “So 21st century learning caters to this aspect of learning and prepares our kids for the future. “It is very student-oriented, as they are given more autonomy to take charge of the classroom and lead their friends in the learning process,” he explained. Facilities at Alfian Mansor’s school are limited, but the SK Sayong Pinang, Johor, teacher makes the best of his situation. “I download my videos from YouTube and other materials online before going to school, and there are apps that can be used offline. “Only teachers who don’t want to put in that extra effort will look at it as burdensome. “We are living in the 21st century; if we don’t make use of these tools, our pupils will lose out,” said Alfian, who also teaches orang asli children. Dr Maszlee, who launched the campaign, expressed his gratitude to teachers, describing them as the backbone of the country. “The campaign is designed to celebrate homegrown Malaysian teachers, and to shine the spotlight on teachers who are employing creative strategies to bring PAK21 into their classrooms. “The ministry hopes these inspiring teachers will start a change, which will build into a tidal wave of 21st century-ready classrooms. “I need every teacher, regardless of where your school is, regardless of your subject, and regardless of whether you are teaching mainstream or special needs students, to reflect on how we are preparing our students for the 21st century. “It is my belief that with the reforms I have initiated to reduce your administrative workload and elevate the status of the teaching profession, you will have more time for the things that matter, especially to inculcate 21st century learning in our nation’s classrooms. “PAK21 represents the direction in which our education must go to ensure our students are ready for the future,” he said. Students who are ready for the 21st century, he said, are those who have a mastery of the 4C1V concept: they must be creative, collaborative, think critically, communicate well, and have a core of values and ethics. Armed with these skills, the ministry is confident students will be able to “survive and thrive”, he added. Genosis training for teachers, school improvement specialist coaches, district education officers and Institute of Teacher Education Malaysia lecturers in Putrajaya. TO cope with the intensified demand for a highly skilled, progressive, and adaptable workforce, the creation, updating, and application of knowledge, is vital, says Agensi Inovasi Malaysia (AIM) CEO Naser Jaafar. Our students, he feels, can become global-minded Malaysians with a high level of empathy and cultural understanding, and are able to play a big role in the 21st century world and beyond. Enter Genosis – a pilot project that will be rolled out in 10 schools – SMK Sultan Salahuddin Abdul Aziz Shah, SMK SS17 Subang Jaya, SMK Sungai Burong and SMK Pengkalan Permatang (Selangor); SMK Bandar Baru Sri Sendayan and SMK Warisan Puteri (Negri Sembilan); SMK Putrajaya Presint 11(1) and SMK Putrajaya Presint 18 (1) (Putrajaya); and SMK Keramat Wangsa and SMK Puteri Ampang (Kuala Lumpur) – next year. The pilot phase, which ends in the year 2021 is jointly funded by AIM and its education arm, Genovasi Foundation (GF). For the future, AIM and GF are looking at models like public private partnerships or social impact funding. Rite Education managing director Elmarié Potgieter, who leads the design of Genosis, explains the aim of the programme. Education experts were brought in to look at what we had. And, Potgieter was pleasantly surprised to find that all the necessary elements were there – investigation, exploration, cross-curriculum work, and concepts. The problem, she found, was that teachers didn’t know what to do. Establishing master trainers among school teachers, school improvement specialist coaches (SISC) from district education offices (PPD), and Institute of Teacher Education (IPG) lecturers, ensures effective cascading of information to schools, says Naser. These master trainers can deliver comprehensive and customised training as they’re very familiar with the school, and understand the positives and challenges, and other intrinsic factors like socio-economic levels and dialects. Additionally, master trainers, teachers, students, and parents, are connected via the Genosis Education Management System (gEMS). “The master trainer process exposes teachers to ways they can integrate 21st century skills, tools and teaching strategies, in their classrooms, while balancing direct instruction with project-oriented teaching methods,” Naser says. All learning materials are online and accessible to teachers, Potgieter adds. And unlike other programmes where trainers come to the school for a few hours and leave, Genosis master trainers are based in the schools so they’re there to guide the delivery long after training is over. Professional development modules are designed as flipped classroom models, and workshops utilise face-to-face and e-learning dimensions, so teachers understand Higher Order Thinking Skills (HOTS) inquiry and project-based learning, Naser shares. Genosis covers the national curriculum’s mandatory subjects, but also allows students to take optional subjects, Naser says. With a broader and deeper set of knowledge and skills, students can adapt their understanding for use in any situation. “Lessons are exciting, engaging and meaningful. Classrooms are more animated. Students are trusted to work independently to find information for themselves. The core of Genosis, he adds, is the individual learning portfolio. Each child has an e-portfolio that will follow them through their secondary years, explains Potgieter. “The comprehensive e-portfolio will include competency assessments by their peers, teachers, parents and themselves. Tasks linked to the United Nations Sustainable Development Goals showcase their design thinking abilities, to solve problems in the community. By the time they get to Form Five, the e-portfolio will show whether the student can work in a team, has good values, and problem-solve. This e-portfolio can be given to universities as proof of the student’s capabilities,” she says, adding that assessment is not about what you remember, but how you apply your skills. The e-portfolio will showcase skills like writing, creating, and producing visuals. The process of building the personal e-portfolio is important. No two student will have the same kind of e-portfolio, she says. The ‘Genosis Benchmarks and Beacons’ guidelines will be used to define and improve the implementation quality and to assess teacher and student development and progress, says Naser. Genosis is in line with the Malaysia Education Blueprint, stresses Potgieter. If this works, it could change Malaysian education. THE creative arts pedagogy (visual and performing arts) in our education system leaves much to be desired. For so long, it has been adduced as an addendum to the educative process. It has never been accorded equal status with science and mathematics. In fact, to most scientists, it would be blasphemy to speak of creative arts, science and mathematics in the same breath. 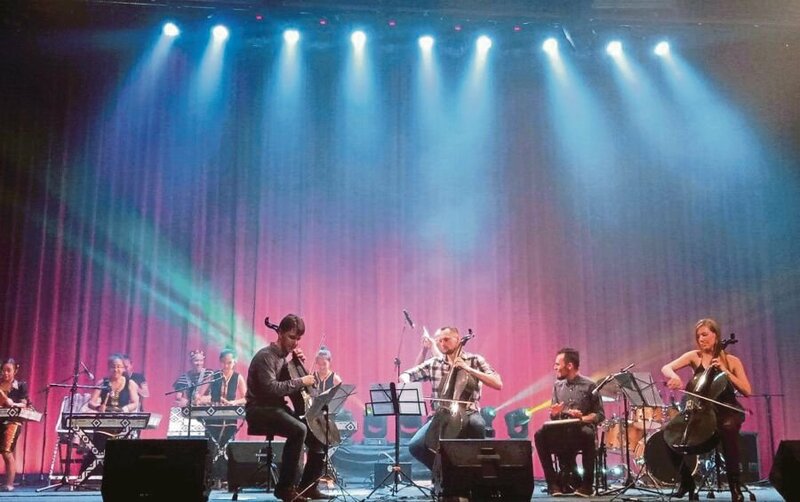 As a result of this neglect and condescending attitude, pedagogy in creative arts education has declined dramatically — there has not been any rigorous development in the teaching methodology and creation of knowledge in these creative fields. It has to fend for itself. The quality of teaching has deteriorated to such an extent that it has been left to the vagaries of the general teaching staff to conduct creative arts classes. This malaise is reflected in the insignificance of the subject in the school curriculum, which only offers it as optional in one subject in visual arts, while performing arts is demeaned and consigned as optional co-curricular activity. From the beginning, the school system de-emphasised the significance of creative arts education. It ingrained in students a condescending attitude towards creative arts. Education has always prioritised the development of verbal rather than nonverbal intelligence. From day one, the students are indoctrinated to excel in subjects such as science and mathematics, especially since the school system is based on the outmoded British system of three Rs, reading, (w)riting and (a)rithmetics. The education system is still mired in this traditional 3R concept which gives priority to science and mathematics. As a result, the creative arts have never been part of the core school curriculum. They are around only to accommodate students who are weak in science and mathematics and the other verbal arts subjects. The two fields of studies, namely the visual and performing arts, suffer similar fate at the tertiary level. In fact, it was only recently that these two disciplines were incorporated into a university’s humanities curriculum that was spearheaded in 1970 by Universiti Sains Malaysia, the pioneer in the pedagogy of creative arts. Thereafter, several other universities followed suit with various levels of concentration. However, entry qualification for the creative arts discipline is mainly based on the standard Sijil Pelajaran Malaysia/Sijil Tinggi Persekolahan Malaysia examination results. They are accepted based on the standard scholastic achievement and only minimally on their informal creative experience. Thus the quality of intake for the creative arts discipline is not based on creative arts ability, but on the general admission designed for science, humanities and social science students. As a consequence, it is difficult to achieve excellence in the visual and performing arts. The programme is watered down with students having to fulfil other university curricular requirements, such as a minor programme outside their chosen field, language and several other inconsequential subjects to graduate. Another significant factor contributing to mediocre graduates is the quality of the teaching staff. Most of the teaching staff in these two fields are neither practitioners nor professionals. They are either PhD or Master’s holders with some experience in their respective fields. Their qualifications are based on theory rather than the practice of creative arts. There is no systematic approach in the teaching of the fundamentals of art forms and it is left to the vagaries and inadequacies of the teachers whose teaching methodology and expertise leave much to be desired. This problem exists because the authorities (policymakers and implementers) are ignorant of the educational and intellectual value of the creative arts and lack exposure to these art forms. If the status quo remains, creative arts education will not get its due recognition. Unless there is a paradigm shift in the thinking of creative arts education as an integral part of knowledge development, application and industry, it will forever remain stagnant. Thus there was excitement and high expectations when the new education minister established the National Education Consultative Council to review the current Education Blueprint, hoping that it would recognise creative arts education as a significant part of the educative process. First, the planning and implementation of creative arts should be left to knowledgeable professionals and not to officers with science or general arts background, who have no inkling of the educational and intellectual values of the creative arts. Second, there is a need to change the general unfavourable mindset of the public with regard to the creative arts and to re-educate them as to the value of this discipline as a tool of character development as well as foster visual and intuitive thinking. This would allow for more support for the discipline as an educative tool in character building and creative development. Third, to develop excellence in the performing and visual arts, only trained teachers and professional artists should be tasked with the transferring of the creative arts knowledge and skills. AS the teacher pointed to the large touch screen, her first-grade classroom came alive. With the click of a link, an animated character popped up on the screen, singing and dancing as it taught the children how to read. The day’s lesson was the Arabic letter “Raa,” and the screen displayed cartoon pictures of objects that contain the letter _ desert, chair and pomegranate _ as the teacher asked the children to come up with other words. The students smiled and sang along. Just a few years ago, such scenes were unthinkable in most Palestinian classrooms. Like elsewhere in the Arab world, schools in the Palestinian territories have traditionally emphasised memorisation and obedience over critical thinking and creativity. Ziad Abu Ein is one of 54 “smart teaching schools” introduced last year. This year, the number tripled. By 2020, all 1,800 public schools in the West Bank are to be part of the programme. Dibas said the goal is to eliminate testing from the classroom. Instead, she said students need to enjoy the learning process to absorb information. On a recent day, her school was buzzing with activity. In a fifth-grade classroom, each child had a tablet and the teacher guided them through an Arabic lesson, using her own tablet to give assignments. Third-grade students went to the smart board, playing a game to learn the multiplication table. In other classes, students drew cartoons to learn the physics of how airplanes fly. An English class did a project about evaporation. Four third-graders recently learned about self-esteem in a lesson called “learning by drama.” They performed a short skit about a shy girl who discovers a passion for journalism and grows up to become a successful reporter. Their teacher, Sawsan Abdat, said the children learned an important lesson that day _ that they need to find what they are good at. After initial scepticism from parents last year, enrolment at the school has nearly doubled. This year’s first grade has nearly tripled to 43 students. These techniques are a radical departure from a system in which generations of students were forced to memorise information and cram for exams under the stern watch of an authoritarian teacher who in some cases would beat them with a stick if they could not complete their work. But with the unemployment rate for new college graduates hitting 56 percent, according to the Palestinian Statistics Bureau, officials realised that something had to change. Education Minister Sabri Seidam also introduced vocational training in grades seven, eight and nine last year to meet the needs of the market. Youth unemployment, particularly among university graduates, is a major problem across the Arab world. The private sector offers limited opportunities, leaving large numbers of young graduates unemployed throughout the Middle East and North Africa. “There is no greater challenge facing the MENA region in its efforts to build a future based on inclusive growth than job creation,” the International Monetary Fund said in a report early this year. It noted that 60 percent of the region’s population is under 30, the world’s second-youngest after sub-Saharan Africa. “Pressures on the region’s labour markets are rising. In the past five years, the region’s working-age population increased by 50.2 million, and 27.6 million people joined the labor force. Yet employment increased by only 25.4 million,” it said. Others in the Mideast have tried to make similar changes. In Egypt, the largest Arab country, the Education Ministry this year is providing students with tablets, along with a new curriculum that enhances critical thinking. The ministry said it is also trying to improve the level of instruction by increasing training and wages for teachers, building more classrooms and creating a more modern classroom through digital learning facilities. The government this year secured a US$500mil (RM2.09bil) loan from the World Bank to help fund the reforms. For now, it appears too soon to say whether the reforms can make a difference. The region’s authoritarian governments might encourage education reforms as an economic necessity but could balk in the future at efforts to nurture a new generation versed in critical thinking. Schools across the Arab world face other obstacles as well. A 2015 study by the UN culture and education agency Unesco talked about chronic underfunding, a lack of qualified teachers and increased class sizes throughout the region. Syrian schools have been devastated by a seven-year civil war, while many schools in neighbouring Lebanon have been overwhelmed by Syrian refugees. US cuts in funding to the UN agency for Palestinian refugees have jeopardised the school year for some 500,000 students, most of them in the West Bank and Gaza Strip. And Israel’s half-century occupation of the West Bank, along with a decade-long blockade over Gaza, continues to stifle the Palestinian economy. “Education in the Arab world is in a very bad condition. The salaries of teachers are very poor, the classes are overcrowded, and schools lack the essential infrastructure,” said Saeda Affouneh, director of the E-Learning Center at al-Najah University in the West Bank. Creativity and innovation alongside emotional intelligence are among the things that we do better than our machines. It is amazing how creative and surprising children can be, even at four years old. So why do we become less creative as we grow older? Many blame the education system, culture and society. This argument has some basis, but there is a deeper biological reason that we need to be aware of too. The human brain is the most complex object in the known universe. In many aspects, the brain is still superior to the most advanced computers we have ever built. The superiority of the brain stems from its ability to quickly learn and develop mental shortcuts. These shortcuts enable us to perform tasks such as split second intuitive decision making. In other words, the brain is a stereotyping machine. Because of this, the brain superiority comes at a price, the various thinking biases. The brain has more than 800 million neurons. Its power emerges from the almost endless number of ways these neurons can network and connect. For children, much fewer connections and mental pathways have been cemented and that is why, they feel free to establish surprising and unusual associations. As we grow older, we learn more things and establish mental pathways that make us both very good at delivering the usual and less capable of establishing the unusual. This is also true for experts. Often new innovations and creative solutions come from outsiders to the field of expertise rather than from within. The question is whether we can maintain our creative potential while we develop mental habits that are necessary to deliver our day to day jobs. To put it another way, using Picasso’s words, can we still paint like children while learning how to paint like Raphael? The answer is YES. The above question, and its answer, are among the most important arguments we face today. As the Fourth Industrial Revolution continues its march towards automating human jobs, being able to cling to what makes humans different is paramount. Creativity and innovation alongside emotional intelligence are among the things that we do better than our machines. Parents, education systems, employers and policy makers ought to pay special attention to that. 5. Challenge yourself. Move out of your comfort zone through trying to learn new things, language or sport. A NEW study on Gen Z in the classroom reveals that Gen Z students are feeling unprepared for the problems the “real world” faces today. As job descriptions change and we move towards an increasingly unpredictable workforce, these students want a greater focus on creativity and hands-on learning in the classroom. The Adobe study, Gen Z in the Classroom: Creating the Future, provides insights into Malaysian Gen Z student and teacher perspectives on learning, creativity, technology and the preparedness for a disrupted workforce. Released recently, the study surveyed 250 Gen Z students between the ages of 11 and 17, and 100 teachers in the country. The research found that 97 per cent of students and 100 per cent of teachers see creativity as essential to students’ future success (highest rating in the Asia Pacific study). 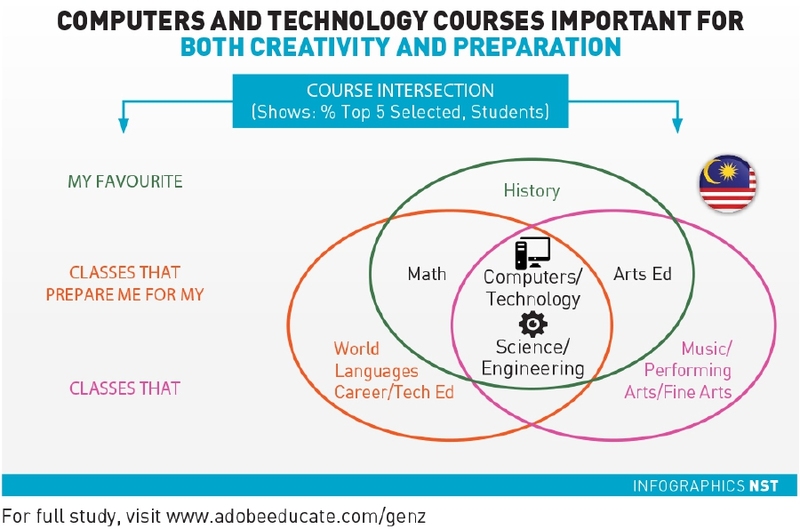 For Gen Z, computers and technology help to hone their creativity and prepare them for their future. Ninety-six per cent of students believe their future careers will involve creating, and 97 per cent of teachers feel Gen Z students will have careers that do not exist today. Gen Z students also shared that classes focusing on computers and technology are not only among their favourites to take, but also hone their creativity, and will best prepare them for their future. Janie Lim, senior director of Marketing for Digital Media, Adobe Asia Pacific, said: “Gen Z students in Malaysia have grown up in a tech-enabled and information-driven world. Access to technology and digital tools has offered unprecedented opportunities for them to explore their curiosity, draw inspirations from others and efficiently express their own creativity. While excited about the prospects, Gen Z students in Malaysia — who see themselves as ambitious, curious and creative — express nervousness about their future careers. Almost 40 per cent of Gen Z students feel unprepared for the future, and feel what they learn outside of the classroom is more important to their future careers than what they learn inside. Technology is GenZ’s native environment. They are passionate about making things better and smarter. Seventy-seven per cent of teachers feel students are more creative than past generations while 61 per cent of students feel they are more creative than past generations. Although Gen Z students in the nation see themselves as more creative than past generations, teachers and students agree that the best method for learning and teaching is through a doing/creating approach, as well as through collaborating with others. This perspective directly correlates with the 68 per cent of educators who wish to evolve the teaching curriculum, and the 66 per cent who look for more opportunities for hands-on learning in their classrooms. It was the early 1990s, he was a music producer and he was referring to the art of music production. He was lamenting how The Beatles in the 1960s could achieve so much innovation using only rudimentary four-track recording machines and basic recording gear and how the industry had evolved to having a lot of technology and awesome digital gear but not much musical innovation. Would The Beatles’ stunning albums like Sergeant Pepper’s Lonely Hearts Club Band be as innovative if John, Paul, George and Ringo had access to unlimited tracks and modern recording equipment and gear? Producer George Martin and engineer Geoff Emerick had to work with what they had. But, with the scarcity of resources, they had no choice but to experiment, to try and keep up with the imaginative minds of the band members, and they produced the sonic masterpieces you hear today. But, this is not just limited to music production. The Viet Cong, armed with limited artillery and firepower compared with the Americans, figured out innovative ways to fight their more illustrious and way more well-equipped foe. They lived in underground tunnels, even digging all the way to below an American base for added safety. They made traps using leftover American bomb shrapnel. The Americans had the military might. They didn’t have to think. Or, maybe that was the reason why they found it so hard to fight in Vietnam. They didn’t have to think. They were not pushed to think. However, the Viet Cong had to be innovative. They had no other way. They HAD to think. Malcolm Gladwell puts forth this idea in his popular book, David & Goliath: Underdogs, Misfits And The Art Of Battling Giants . He argues that a person with limited resources would be forced to be more creative than someone who had a lot of resources. Gladwell mentioned a fact — that many successful people have dyslexia — and argued that this disability was a GOOD thing as it forced them to master other skills like developing high-level listening skills or strong memory that eventually helped them to be successful in life. He said David, by popular notion, wasn’t expected to win his battle with Goliath. But, because he was an underdog, and had to be more creative and clever, actually he SHOULD be expected to win. Maybe by giving someone a disadvantage, we are helping him to win. “Necessity is the mother of invention” is an oft-said phrase. I think it should be reworded to scarcity being the mother of invention. Which brings me to another thought. Our minds. Last time when we had nothing but a stick to play with, it didn’t stop us from imagining the most awesome scenarios. We turned our gardens into battlefields, and our beds into spaceships. We created our own games. Now, we have supreme technology to “help” us play and imagine. Someone else is designing our world for us, creating our games for us. We don’t have to think. Now, we are exposed to a barrage of information and news, thanks to social media and the proliferation of resources where we can get information. We have Wikipedia, we don’t have to research, someone else has done it for us, right or wrong. With so much information coming our way, we don’t have time to go into details, or research what it is we are reading. You are currently browsing the archives for the Creative and Innovative Education category.